A teenager fell from a 126ft aqueduct when an upright railing "came away in his hands", an inquest has heard. Kristopher McDowell, 18, from Cefn Mawr, Wrexham, died on 31 May 2016, after falling from the Pontcysyllte aqueduct. An inquest was told Mr McDowell was with friends when he squeezed on to the outside of the aqueduct's railings. The railings had been tested for safety weeks before Kristopher's death, an inspector told the hearing. Coroner John Gittins told an inquest jury on Tuesday there may be an element of stupidity in Mr McDowell's actions, but said: "One of the uprights came away in his hands." He added: "How is it possible for that to happen? What might've led to that? How is it that these things are inspected?" The inquest in Ruthin, Denbighshire, heard Mr McDowell had been working at a McDonald's restaurant near Chirk, and was met by three friends to walk home after his late-night shift. One of his friends told the inquest Mr McDowell "started to squeeze himself through a gap in the railings" and heard another friend shout "he's gone" and other shout "no" before hearing "a thud" from below. Mr McDowell's friends tried to save him but he was pronounced dead at the scene. They described him as a "happy" person, who could sometimes be "hyperactive" and said nobody had been heard "egging him on". He reportedly told the group he was "not scared" to hang off the edge. 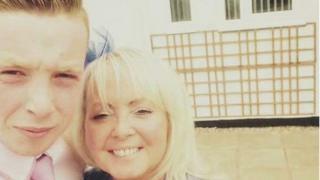 Mr McDowell's mother, Samantha McDowell, said she knew her son's actions had been "foolhardy," but claimed "Kris or any other person should not be allowed to get through the gap". She said she and the family found the death "unbearable" because it "could have been avoided". She added: "The fact is, if the bar hadn't given way Kris would still be here today." Mr Gittins told Mr McDowell's family and friends he wanted to ensure matters were thoroughly examined. An inspector from the Canal and River Trust, which manages the network, said the 1,140 upright railings were examined just weeks before Kristopher's death and had passed a test as "fit for purpose". Martin Watson, a length inspector with the Canal and River Trust, said the role meant being responsible for an 8km stretch of the waterway, checking for maintenance issues. He said the railings were tested by using a stick to tap against them and a different, "brighter" sound would suggest further investigation was needed. The last inspection was completed on 5 May and he said he knew he "didn't find anything out of the ordinary". Asked by the coroner if he might have missed the upright that eventually came away, he said he did not think he missed any of them. The coroner asked whether he accepted the upright - despite being used inappropriately - was not secure when Kris died. "I think it was fit for purpose," said Mr Watson. The inquest is expected to conclude on Wednesday.